We use ours inside of a witch's cauldron, topped with cheap sheer spider webbing for an eerie ''foggy'' effect. Also looks great tucked into a creepy costume for extra attention! Spooky safety lighted display of animated and static props for any haunted house, castle dungeon, cemetery graveyard, mad scientist laboratory, butcher chop shop, and insane doctor lab... Scary, attention-getting year 'round create-a-scene setter accessory! Create wild FX or have a rocking dance party with our classic LED Lightning Strobe Light. Special effects light sensations are spooky and kooky fun for costume parties and raves! Make your Halloween props really pop! 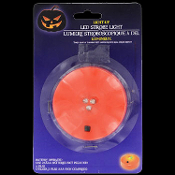 Pumpkin Strobe Light has 3 ultra-bright, long-lasting LED lights that flash rapidly when you flip a switch at the base. The LED lights remain cool to the touch and are therefore much safer than candles and incandescent bulbs for illuminating jack-o-lanterns, witch's cauldrons, skull decorations, Halloween costumes and luminaries. Use your imagination! -Safe LED Strobe Light stays cool to the touch. -3 Rapidly Flashing LED bulbs for real strobe lighting effects! -Requires 2 AAA *batteries (*NOT included).